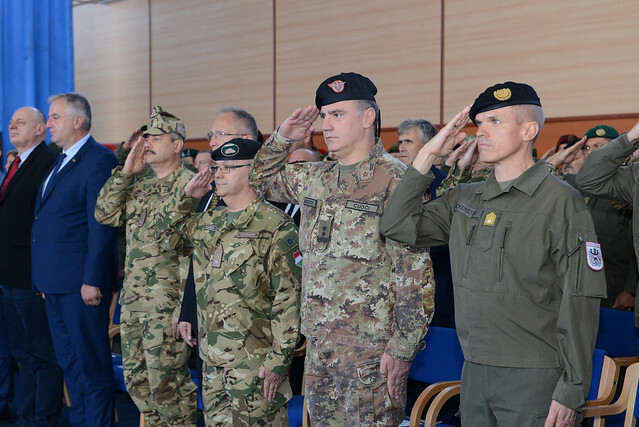 Pristina - KFOR Commander, Major General Salvatore Cuoci, presided over the Transfer of Authority of the Deputy Commander of KFOR, Brigadier General János CSOMBÓK to the incoming DCOM, Brigadier General Reinhard Ruckenstuhl. The ceremony was attended by International and local authorities and personnel of all the KFOR units. On the arrival, COMKFOR accompanied by the outgoing and the incoming DCOM inspected the troops. Afterwards, BG CSOMBÓK took the floor delivering his farewell speech. He expressed his gratitude and his satisfaction for all the achievements reached during this year of intense work. Finally, Brigadier General János CSOMBÓK, was awarded with the non- article 5 Balkans NATO medal, the KSF medal of "Selfless Service”, the USA Legion of Merit and the Italian Medal. This moment marked the legitimation of the "enduring commitment” and dedication he has shown since his arrival in October 2017.